When considering different items for hotel room decoration, you want to find the right balance between choosing objects that will make guests feel at home and that will make the room beautiful and unique. This is exactly what you will get with Facet, our hanging room divider. They will admire the gorgeous design while also enjoying the practicality of it. Endless possibilities with your hotel room decoration. Facet as your hotel room decoration item can be used to provide privacy for the bathroom area, or it can be used to divide the sleeping area from the lounge area in bigger hotel rooms. It can also simply be used for decorating a plain wall. Our room divider Facet can be ordered in many different sizes. We offer 117 different standard sizes in our webshop, but we can also adjust it to any specific needs you may a have. The diamond-shaped facet is available in 6 different colors to suit your taste. If you would like the interior of your hotel room to be crisp and bright, you can choose the color white. If you prefer it to be more on the dark side you can go for color graphite. Furthermore, the installation of Facet is super simple. It is not heavy at all (only 4500g per m²), which means it is suitable to hang from most ceilings. We also provide an easy to follow step-by-step manual for attaching your newly acquired hotel room decoration item. If you have any questions, we are only a phone call or email away. The room divider featured in the picture above is in a hotel room in Moscow. See how the bright white of the facets contrasts perfectly with the cobalt blue of the wallpaper, lamps and bedside tables. Another layer of contrast is seen in the neat geometric pattern of Facet versus the spilled ink look of the wallpaper. The interior design of this hotel is done by Karina Merzlikina. The 3D elements of the Facet room divider let's you play with shadow and light. A full modulair system for dividing spaces or decorating windows. The Facet room divider offers unlimited possibilities and is designed by the young and talented duo Bas van Leeuwen and Mireille Meijs of the creative design label Blooming. The Facet Room Divider is perfect to use in restaurants, bar, retail, welness and office enviroments. 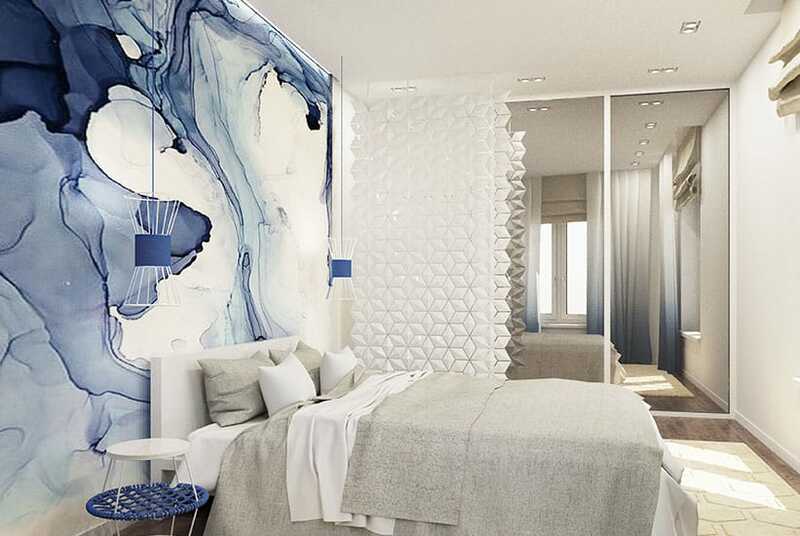 The 3D elements can be rotated individually and form an unique interactive pattern in this likewise unique room divider. Mireille Meijs got the inspiration for her room divider facet during a friends' gathering at her home, where sunlight was pouring through the window. Since she believes that sunlight is too beautiful to be convered completely by ordinary curtains. She designed the minimal yet dazzeling room divider Facet, which people can adjust according to how many rays they was coming into the room. When compared to the rest of the world, the Dutch are ofrten seen as very down-to-earth. This is reflected in the design - strongly conceptual, simple, clear but still very suprising. Precious Idea For Your Home! Dutch design firm Bloomming has a precious idea for your home: a ceiling-hung curtain of modular, multifaceted white diamond. Designed by Mireille Meijs, each panel can be individually tilted up or down, allowing the user to control the amount and shape of the light. Room divider Light Facet can be mounted as a room divider or in a vertical, horizontal or diagonal configuration.